The Griffith has a classic sports car silhouette accented with deep air intakes. 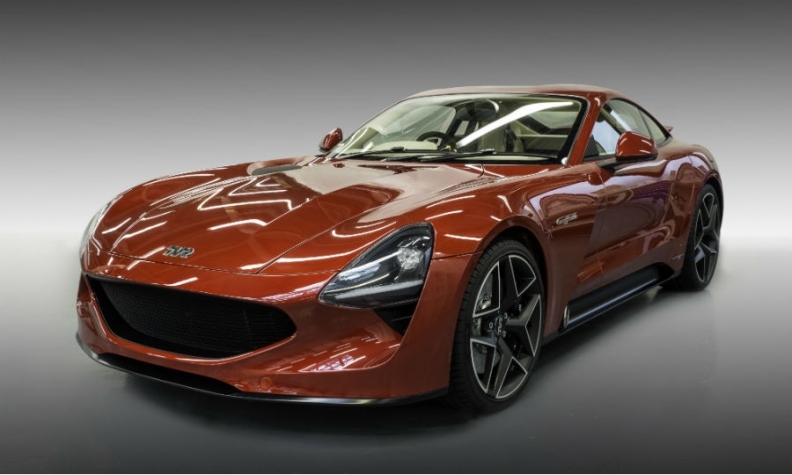 LONDON -- British niche automaker TVR will begin production of its two-seat Griffith sports car next year. The Griffith is powered by the same Ford V-8 engine used in the Mustang, but the unit has been boosted to make 500 hp by British engine tuner Cosworth. Top speed for the Griffith is more than 200 mph (321kph), TVR said. TVR was founded in 1947 but stopped making cars in 2004 after running out of cash. Computer games magnate Les Edgar has revived the brand after buying its assets from former Russian owner Nikokai Smolensky in 2013 for an undisclosed sum. Edgar said the Griffith is "unmistakably a TVR, a British muscle car that's as awesome and brutal as it is charismatic and refined." He also said it offered far more technical sophistication, comfort and reliability than previous cars. Reliability has often been a TVR weak point. The Griffith revives a nameplate from TVR's past and was designed by Gordon Murray, who became famous for his work within Formula One racing and for helping create the 1992 McLaren F1 supercar. The car's exterior has been designed to be both visually striking and provide sufficient aerodynamic stability at speed. To help this the Griffith has a flat underfloor to achieve so-called "ground-effect" aerodynamics, only the second front-engine production car to feature this, TVR said. The car's low weight of 1250kg is achieved by the use of carbon composite panels bonded onto a tubular steel structure. It is the first car to use the iStream process, a construction and manufacturing technique devised by Murray to speed up production and cut costs. Production starts late 2018 in a new factory in Wales. TVR last year said it will spend 30 million pounds ($40 million) in setting up its production facilities. The car will start at 90,000 pounds.